Many of the puncheurs who had marked out today’s stage, came up short as a strong breakaway of climbers made it to the finish. They will get what could be their final chance in this race on stage 12 which includes a tough second half with several short, steep climbs and an uphill finish on those short walls that have so often characterized the Giro and the Vuelta. The Giro d’Italia and Vuelta a Espana are famously known for their uphill finishes on short, sharp walls that always produce a great spectacle. This year’s Italian grand tour again offers this kind of punchy finale even though the short Monte Berico in Vicenza is not one of those incredible steep climbs that have often featured mainly in the Vuelta a Espana. The short climb will be the scene of an exciting battle at the end of the 12th stage. The stage has a length of 190km and brings the riders from Imola to Vicenza. It is clearly divided into two parts: the first 130 km across the Po Valley are totally flat while the last 60 km are very wavy and rough, with a few demanding climbs and an uphill finish after a final ramp. The route runs across the Basso Ferrarese region and the Polesine area along flat, largely straight and regular-width roads, worn out at points. Just past Torriglia, the route takes in the easy-to-ride Castelnuovo climb (category 4, 5.4km, 5.0%, max. 11%) in the Euganean Hills and then crosses a short sector of flatland leading to the Berici Hills. The course clears the Crosara climb (category 3, 3.7km, 9.1%, max. 17%), going up from the Mossano slope with almost 2 km at gradients exceeding 10% and peaks reaching as high as 17% in the first half, on quite wide roads leading to the technical Lapio descent and, eventually, to the challenging final 15 kilometres. After Fimon, the route takes in a 2km climb with an 8-9% slope, peaking as high as 11% at points near the top. Then comes a short false-flat drag, followed by a demanding – yet short – descent, leading to the last 5km which run entirely on flat terrain up to 1,200 m from the finish where the final ramp begins. The last km has an average 7.1% gradient, with slopes approaching 10% in the final part and topping out at 11% in the very last stretch of the ramp. The home straight is 300m long, on 7m wide asphalt road. After the descent there are no major technical challenges as the road just includes sweeping turns inside the final kilometre. Vicenza has hosted a Giro finish 9 times in the past, most recently in 2013 when Giovanni Visconti attacked on the Monte Crosara and managed to hold off a small peloton that was led home by Ramunas Navardauskas. The finale on Monte Berico was used in 1967 when Spaniard Francisco Ibarra Gabica took the win. The riders have mostly had perfect weather for the 2015 Giro d’Italia but it seems that things will change for the second week. After today’s wet stage, more rain is expected tomorrow. It is likely to be dry at the start but rain is forecasted for most of the day. Furthermore, it will be pretty cold as the 18-degree temperatures in the morning will drop to just 15 degrees for most of the stage. Finally, it will be a windy day as a strong wind will be blowing from a northeasterly direction. This means that the riders will have a cross-headwind almost all day before they turn into a crosswind when they hit the Castelnuovo climb. In the finale, the will be a tailwind on the penultimate climb and then the riders will again turn into a cross-headwind for most of the final part of the stage. Only 800m from the line, they will turn into a tailwind. 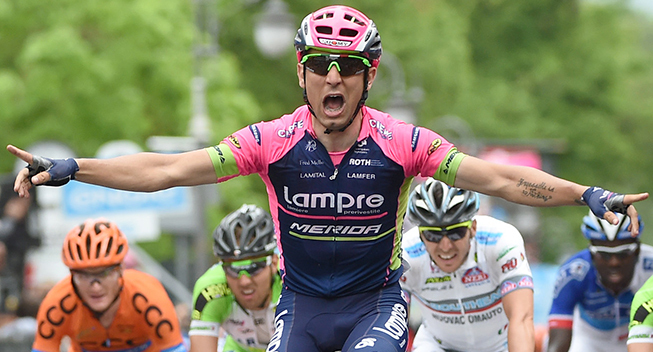 Going into the Giro d’Italia, the classics specialists liked what they saw. The first and second week were loaded with opportunities for them and it was no wonder that riders like Philippe Gilbert, Diego Ulissi and Simon Gerrans were in a confident mood when they lined up for the start in San Lorenzo al Mare almost two weeks ago. However, their opportunities are about to come to an end. The tough start to today’s stage made it impossible for them to get into the move and instead it was a formidable group of climbers that got clear. They turned out to be impossible to catch even though BMC and Orica-GreenEDGE did their best and so the stage lived up to our prediction from yesterday that it would be very hard to bring back the kind of break that would get clear in that kind of tough opening part. Now the classics riders only have one real opportunity left. Friday is a day for sprinters and then it seems that it is all about the GC for the rest of the race, with just two small opportunities for the fast men separating the many big days in the mountains. However, tomorrow is tailor-made for puncheurs and Ardennes specialists and so they will go all out in a quest to come out on top. Tomorrow’s stage is the complete opposite of what we had in stage 11 which was characterized by a very hard start and an easier – but not easy – finale. Tomorrow it will be a very easy start to the stage and then a brutally tough final third of the race. This means that the race should be much different from what we saw today. The first part is completely flat and this will make it much easier for the teams that have strong puncheurs, to control the race. BMC, Lampre-Merida, Movistar and Orica-GreenEDGE have all marked this stage out as one of their biggest goals for the entire race and they will do their utmost to make sure that the early break is not too strong. Nonetheless, we should be in for an aggressive start with numerous attacks but in this kind of terrain, it should be possible to prevent a big, strong group to get clear. Furthermore, there will be a rather strong headwind all day and this won’t make it any easier for the break. We expect BMC, Movistar, Lampre-Merida and Orica-GreenEDGE to all do some chase work and so we don’t leave the early break much of a chance. While the first part of the race could turn out to be pretty boring, we can expect big fireworks in the finale. Many will have their eyes firmly fixed on the uphill sprint but it will be a tough affair to still be in contention when we get to Vicenza. The first climb of Castelnuovo may not be very hard but no one should underestimate Crosara which is very steep. In 2013, the riders tackled this climb and it almost blew the peloton to pieces. That allowed Giovanni Visconti to attack and even though a few sprinters like Ramunas Navardauskas, Luka Mezgec, Sacha Modolo and Danilo Hondo made it back to the peloton, they never brought the Italian back. In the end, it was a small 39-rider group that sprinted for second place. This year Crosara is located much farther from the finish but the run-in to Vicenza has been made complicated by the small Pararolo climb which is steep enough to do some damage. Furthermore, it is no flat finale as the riders will finish on the Monte Berico which will of course completely change the nature of riders that will have a chance to prevail in this kind of stage. Croasara is steep enough for the GC riders to do a battle but it comes too early to make a difference. However, Astana have done nothing to hide that they want to take the maglia rosa and they have a great chance in this kind of finale. Fabio Aru is no puncheur but he has a decent uphill sprint and if he can make it into the top 3, he will find himself in pink. However, he has no chance against the fastest riders and so we wouldn’t be surprised to see Astana hit the front on the final two climbs to make the race as hard as possible. If they do so, it will do a lot of damage and it will be a very small peloton that sprints for the win on Monte Berico. That will also make it impossible for anyone to make a Visconti attack and so it will come down to an uphill sprint. If Astana decide to take it easy, there is a chance that a strong group of riders can ride away and upset the puncheurs. However, the most likely outcome is an uphill sprint on the Monte Berico. It is one of those short climbs that characterize the Giro and the Vuelta but it is not the kind of wall that has so often been dominated by Joaquim Rodriguez in the past. Only the second half is very steep and this should open the door for a wider range of riders. Last year Diego Ulissi won two stages in this race when he emerged as the fastest in two uphill sprints. In stage 5, he won the battle on a climb that is very similar to tomorrow’s even though it is less steep. In stage 8, he won a much harder stage that finished at the top of a longer climb which had a very steep final section. Ulissi has had a tough start to the year as he only got back to racing in April after his suspension. Hence, he has been off the pace in most of his races but he is gradually riding himself into form. He proved that he is getting close to his best level when he won the uphill sprint in stage 7 which should actually have been a bit too easy for him to really excel. Tomorrow’s steeper finish suits him a lot better and the finale is simply tailor-made for him. Today he seemed to take it easy to stay fresh for tomorrow and it would be stupid if Lampre-Merida don’t try to set their puncheur up for the win. He is clearly not at his 2014 level yet but he should be good enough to win this kind of uphill sprint. If Astana don’t take the initiative, Lampre-Merida should try to make things hard on the climb and then it will be hard for anyone to beat Ulissi in the uphill sprint. Today BMC went all out in an attempt to win the stage but it wasn’t to be as they ran out of power in the end. Now Philippe Gilbert only has tomorrow’s stage as a big opportunity and he will be keen to finally get that elusive stage victory. Gilbert is clearly riding very well and everybody knows how strong he is in this kind of uphill finish. As a former Fleche Wallonne winner, he knows how to sprint on these steep gradients and even though he would probably have preferred a slightly less steep finale, he should be among the best in this kind of finish. In stage 7, we never got the chance to see what he could have done against Ulissi as he dropped his chain with 1400m to go and had to sprint just to get back into position. He may not be quite as strong as Ulissi in such a steep finale but he will definitely be a very strong contender. When he looked at the roadbook, Juan Jose Lobato made this stage his biggest goal of the entire race. The Spaniard has emerged as one of the best uphill sprinters in the world. Last year he took uphill wins in the Vuelta a Burgos and the Tour de Wallonie and in the early part of the year he was very strong in similar finales in the Ruta del Sol and the Dubai Tour. Lobato was clearly not in his best condition in the early part of the race but he still managed to sprint to second in stage 7. Now he seems to have found his best legs. He was always in the front end of the peloton in today’s stage and when Contador attacked, it was the Spanish sprinter who sprinted past the race leader. In the end he easily won the sprint for 10th. The final climb could be too hard for Lobato but he will definitely give it his best shot. If he has the legs of today, there is no reason to suggest that he can’t beat Ulissi and Gilbert. The main challenge for him will be to survive the Crosara climb which could be too hard if Astana decide to go full gas. As usual, Orica-GreenEDGE have two riders for this kind of stage. Simon Gerrans and Michael Matthews are both suited to this sprint and they will have a hard time choosing their leader. Today they didn’t really seem to make a clear choice and they were both saved for the final sprint. Tomorrow it could be more of the same and they may both be given their chance. However, we would put Matthews on top of their list of contenders. The Australian won a very hard uphill sprint in last year’s Vuelta and this year he is clearly riding at an even higher level. In the Amstel Gold Race, he was even able to stay with Gilbert when the Belgian went full gas on the Cauberg. In this race, he has been climbing amazingly and was even in the Uran group in the hard stage 9. Tomorrow is a big goal for him and he has a very good chance of making it win number 2. Simon Gerrans will also be a formidable contender. He may not have Matthews’ track record in this kind of finale but he is still strong in uphill sprints. He has finished on the podium in the Amstel Gold Race when it still finished on the Cauberg and this will make him one to watch if he is given the chance to sprint for himself. Carlos Betancur is gradually riding himself into form after more than a year of suffering and even though he has still not taken that elusive win, he is definitely very strong. To have made the right break in stages 8, 9 and 11 is very impressive and he clearly gets stronger with every passing day. In his heydays, he was very hard to beat in this kind of finale. He may still not be strong enough to beat the best but with the talented Colombian, everything is possible. Fabio Felline made a stupid mistake in today’s stage as he was too far back on the descent and so missed out on a great opportunity. Tomorrow he will be keen to give it another try. He may never really have been a contender in this kind of uphill sprint but he has all the skills to do well. This year he has improved his climbing very much and he still seems to be close to his best form. Another rider who was once very strong in this kind of uphill sprint, is Damiano Cunego. He has won the Amstel Gold Race at the top of the Cauberg and he has been on the podium in Fleche Wallonne. In this race, he is better than he has been for several years and so he should be in the mix in tomorrow’s stage. Francesco Gavazzi was looking very strong in today’s stage and even made it back to the peloton after he had been taken out by Rigoberto Uran. The Italian has clearly benefited from his move to Southeast and he is strong in this kind of uphill sprint. He has won a tough stage in the Tour of Beijing in this kind of finale and he has the skills to be among the best here. His in-form teammate Mauro Finetto could also be one to watch. Tom-Jelte Slagter took it easy in today’s stage and will be ready to give it a go in a finale that suits him really well. He has had a slow start to the year but his great ride in stage 9 suggests that he getting closer to his highest level. The Dutchman has finished in the top 10 in Fleche Wallonne and won stages in Paris-Nice in these finishes, meaning that he will be one to watch. The main question is whether his condition is already good enough. Lobato is definitely the main rider for Movistar but Giovanni Visconti may also take his chance. The Italian is in great condition and he has always been fast in a sprint. He has lost a bit of weight which may favour him in this kind of steep finale so if the going gets too tough for Lobato, he will be ready to sprint. Among the GC riders, Fabio Aru and Rigoberto Uran will have the best chance in this of uphill sprint. To win the stage, they will probably have to get rid of the real puncheurs but if Astana go full gas on the final climbs, they may have a chance. Jokers: Damiano Cunego, Francesco Gavazzi, Tom-Jelte Slagter, Giovanni Visconti, Fabio Aru, Rigoberto Uran, Mauro Finetto.